“I didn’t invent the title ‘sob sister,’ but I’m the first gal reporter who ever used it,” Mildred Gilman Wohlforth told an interviewer in the 1980s. The term described Roaring 20s reporters who specialized in heart-rending stories of personal tragedies, and Mildred Gilman was one of the originals as well as one of the highest paid in New York. Her subjects ranged from sordid crimes to White House society, interviewing murderers and heads of state with equal expertise. But Mildred Gilman was prolific writer who did much more sophisticated work over her career. 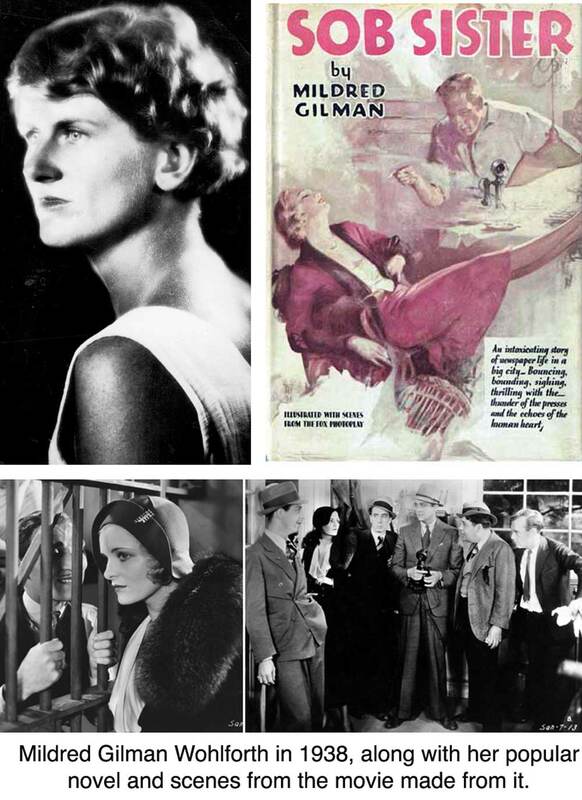 She wrote eight novels; “Sob Sister,” first published in 1931, came out in several editions, and was turned into a movie the same year, starring James Dunn and Linda Watkins. She also wrote many magazine articles. One piece in The New Yorker in 1928, which could be as appropriate today was it was in the ’20s, was about a mother and son being interviewed for a place in an upper-crusty New York City nursery school. The Chicago native wrote her first story when she was 12 and began selling them when she was at the University of Wisconsin. After graduation she got a job as secretary to noted New York World columnist Heywood Broun, and frequented parties with the likes of Dorothy Parker, Alexander Wollcott, Robert Benchley, Harpo Marx, Bennett Cerf, Sinclair Lewis, Paul Robeson, and Harold Ross (she wrote one of the first profiles, on Robeson, for Ross’s then-new New Yorker). While working for Hearst’s New York Evening Journal, she met Robert Wohlforth, a reporter for the competing Morning Telegraph. They were married in 1930, and later bought a 1730 home on Rockwell Road. She continued to write throughout her life and among the many celebrities she interviewed were Henry Ford, Thomas Edison, Shirley Temple, Amelia Earhart, Gene Kelly, and Jimmy Durante. She was also supposed to interview Hitler in 1933, but the Gestapo, distressed at probing questions she had already asked Hermann Goering, threw her out of Germany. In Ridgefield, she was the first chairman of the Historic District Commission, promoted planning and zoning, and penned scores of letters to The Ridgefield Press aimed at the betterment of the town. Well into her 90s, she rode her bicycle three miles a day. She died in 1994 at the age of 97.